So, how did you experience resistance in the last 24 hours? You saw this reflection in your email box this morning, were you resistant to watch it? Did you put it off? Did you watch it straight away? Did you say, “Oh, I’ll do that later,” or “I’ll do that tonight”? As we make this journey together, you’re going to encounter resistance in a thousand different ways. There will be hundreds of temptations to do the program, not do the program, push the video back later into your day, or watch the video and not do the reflection. There will be a lot of temptations along the way, and behind all those temptations, very often, you’re going to find resistance. What we’re talking about here, this concept of resistance, it’s real. It’s something we experience every day. And it’s something we experience in relation to everything. That’s really the paradox of happiness. It’s that, we know the things that make us happy, we just don’t do them. And very often the reason we give for not doing them is because we’re too busy trying to be happy. 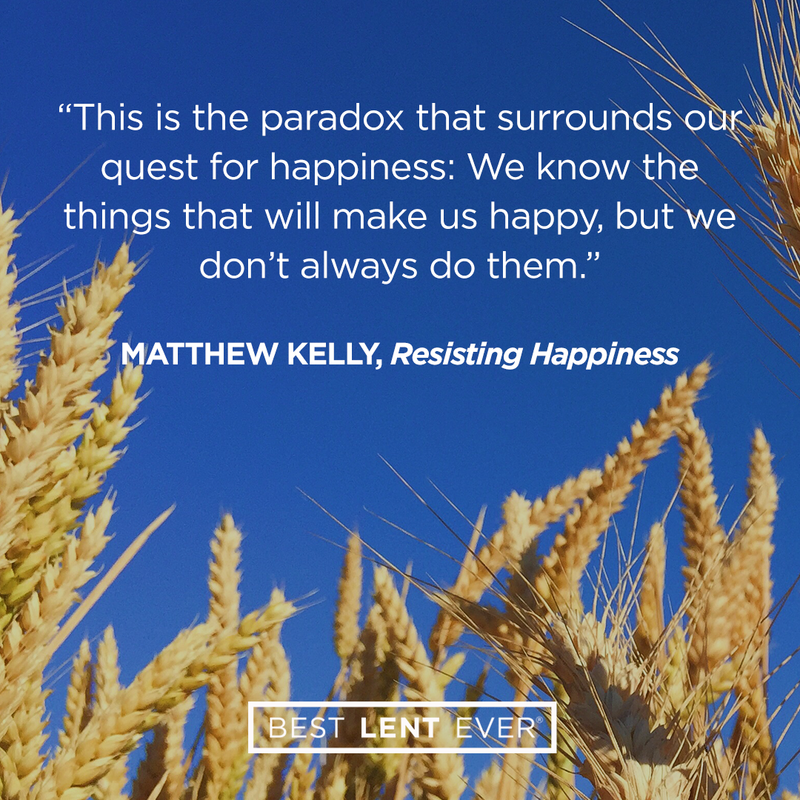 It’s the stunning paradox that surrounds the desire that we all have for happiness. We want to be happy, but we don’t do the things that make us happy, because we’re too busy trying to be happy. And it relates to all aspects of our lives. So if you think of the four aspects of the human person—physically, emotionally, intellectually, and spiritually—I know the things that make me happy. Physically, if I exercise regularly, and I sleep regularly, and I eat the right sorts of food, I’m just massively happier than I would be if I neglect those things. Emotionally, when I give focus and priority to the most important relationships in my life, I’m just happier. Intellectually, when I make the effort, when I have the discipline to read for a few minutes each day, my vision of myself expands, my vision of the world expands, my vision of God expands. I become more focused, more alert, more vibrant, and I’m happier. And spiritually . . . silence, solitude, Scripture, sacraments, they make me happier. I am a-better-version-of-myself when I spend time in these disciplines. But I can come up with a thousand reasons every day why not to do any of those things. And behind every single one of those reasons, we find resistance. And that’s the happiness paradox. We want to be happy. In 90% of the cases, we know the things that will make us happy, but we don’t do them. Why? Resistance. Here’s the thing I want you to keep in mind: In every one of those situations, either resistance is going to win, or you’re going to win. There’s no middle ground. Either resistance wins, or you win. There’s no middle ground. So you’ve got to see that as a challenge. And you’ve got to get out there and slay resistance in the moments of the day. Identify 3 activities that increase your happiness. Write them down. Jesus, help me to stop chasing the things that destroy my happiness, and fill me with the desire to pursue the things that will bring me lasting happiness. Today’s personal reflection features Dynamic Catholic team member Amanda Recktenwald. Amanda is our email team leader, coming to us from Neenah, Wisconsin. Amanda is fluent in Spanish, can do a convincing British accent, values her bedtime over everything, and can list the U.S. presidents in order. Are you as happy as you could be?